The notorious application of secrecy laws and a deeply engrained culture of not disclosing even basic information to the public has prompted Globe International (GI), a local Mongolian CSO, to pilot a program that empowers citizens to demand greater responsiveness from officials and local governments in two aimags (provinces) in Mongolia. 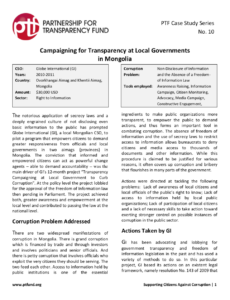 The conviction that informed and empowered citizens can act as powerful change agents – able to demand accountability – was the main driver of GI’s 12-month project “Transparency Campaigning at Local Government to Curb Corruption”. At the policy level the project lobbied for the approval of the Freedom of Information law then pending in Parliament. The project achieved both, greater awareness and empowerment at the local level and contributed to passing the law at the national level.